6.15 points at 13 votes (rank 603). 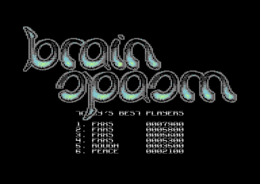 In Brain Spasm you need to get together stones with the same symbols. The stones can be moved to the next obstacle where they stop automatically, there is no way to halt in between. Diamonds also appear on the field and can be a nuisance or a help. Many puzzle games are either too difficult or too easy. According to the description this game is an exception. It is the right mixture, as the difficulty grade rises with the own skill. The game is kept mainly in grey, blue and black. Only the diamonds are yellow/rosy. The symbols on the 16 different game stones are well recognizable and make for some variety. The moving, appearing and disappearing of the stones is animated. In the background a melody plays permanently, consisting of two themes. One part of the melody is calm and puts over a corresponding atmosphere. The other part creates hecticness. 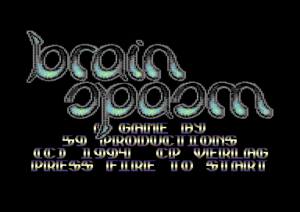 Both parts are played in turns endlessly, independent from the game status. At the start of the game one can choose between the starting levels 0-9 and intial filling of the field 0-9. After that the game starts immediately. 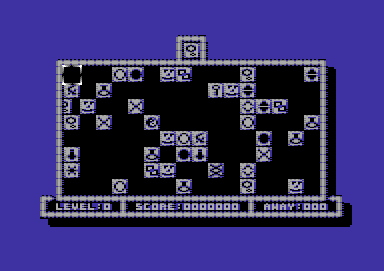 The main action takes place in the rectangular game field. Here the different stones appear and here you act with the cursor. Above the game field there is a small square which shows the next stone coming up. 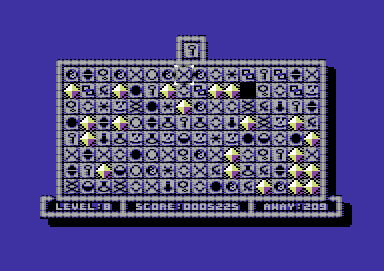 In the lower bar you see from left to right: the level, the number of points and the number of removed stones. While the number of points can be displayed up to 9.999.999, there is only a three-digit display for the number of removed stones, which starts again at zero, if you have removed over 999 stones. Gaming stones: They appear at the border of the game field and carry a symbol. 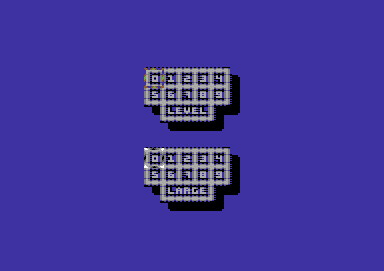 With joystick up, down, left or right you move the cursor onto the stone of your choice, press the fire button and press the stick into the direction into which the stone should go. The stone then runs into the corresponding direction stopping at the next obstacle, which can be a diamond, another gaming stone with a different symbol or the wall of the field. If two or more stones of the same type meet, they dissolve. Diamonds: They appear less often, but at the border and in the middle of the field. On the one hand they block the way to a stone with the same symbol, but they can also help to get to another stone, as they offer corners for navigation. After a while some of the diamonds disappear again and reappear at a new place. After some stones have been deleted the level rises by one. With every raising level also the speed rises and with this the interval in which the stones appear. At the highest difficulty level at last one works up a sweat and loses track. The game is over when the whole border is occupied. Of course you can remove the stones from the border and push them to the middle, if you cannot bring them together with a twin due to the obstacles. So the game then ends finally when there is no space left at all. The game requires permanent concentration. There is no pause between the levels, they merge into each other. 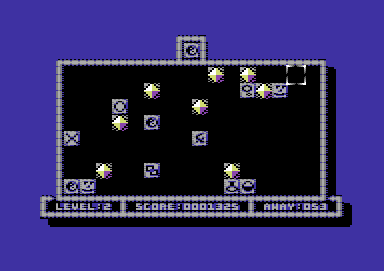 Some elements as choosing the difficulty level and filling of the field at the start, the merging of the level, the disappearing of the combined stones and the preview to the upcoming stone remind a bit of the classic Tetris. There are 25 points per deleted stone. As you always destroy at least two or maybe three stones, you get 50 or 75 points per combination. It is irrelevant which symbol the stone carries. No solution necessary. You need to endure on as long as possible. The version "Chromance" does not offer any trainers (would also not make sense), but it has a saveably highscore list and an option to set it back to original values or zero. Camailleon: "Although the game principle is simple, the game is much fun, as you need logic and power of endurance. It is also important to stay calm in the highest level." Blubarju: "Full agreement with Camailleon's critic! At the start one is almost bored (especially when starting at 0 and empty game field), but later a real hecticness arises and one is almost only occupied with pushing the stones away from the border to make space for new stones. Good training for eyes and brain. 8 points." FXXS: "I basically agree with the previous opinions, but a few sound effects and regular breathers would have been nice. 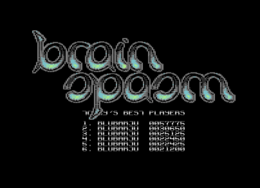 However, I will probably play "Brain Spasm" more often in between. 7 points." 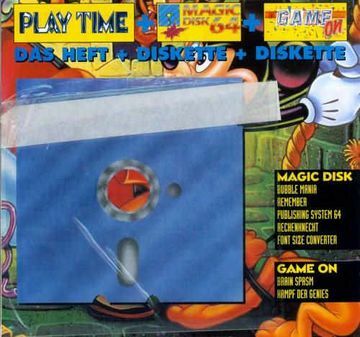 The game was released on the Game On 11/94, which was published in combination with the Magic Disk in the Play Time. So there is no own cover for this game. This page was last modified on 29 December 2018, at 05:41.